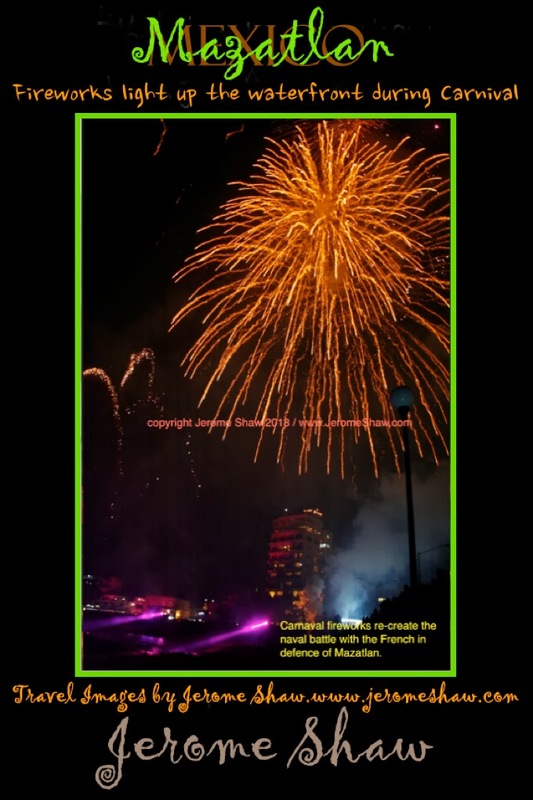 Fireworks over Mazatlán Mexico recreate a 19th century naval battle with the French. Carnival in Mazatlán is host to many exciting events. One if the most spectacular and visually inspiring is the firework display over the Bay of Olas Altas recreating a famous naval battle with the French Navy by the citizens of Mazatlán in defense of their city. The best vantage for the fireworks display is from Olas Altas Beach or along Paseo Vista Hermosa on the headlands of Cerro de la Neveria, You can also watch from the Balcones de Loma Linda along Paseo Clausen. The display is an impressively long and impassioned battle with volleys originating both from shore and from a floating barge in the bay impersonating the French Battleship. The re-creation of the harbor’s successful defense against French invasion by Mexican forces come to life as pyrotechnic sounds simulate cannon fire exchanged over sea and land during the battle between the people of Mazatlán and the French man-of-war, “Le Cordeliere. You definitely sense what the battle must have seemed like to the people of Mazatlán as they watched the defense of heir city. The French were intent on taking control of Mazatlán but the mostly Spanish citizenry were more insistent that they remain under their own control. A battle was waged over several days with the outmanned but determined Mazatlánotecs coming out on top. This photo was taken from the Pedro Infante memorial monument & shows the firework over Olas Altas Beach.